Neighborhood Bike Works was created in 1996 as Youth Cycle & Recycle, a project of the Bicycle Coalition of Greater Philadelphia. Our first youth Earn-A-Bike programs were launched through the Philadelphia Housing Authority, at Westpark Homes at 46th & Market, and at a church owned by University of Pennsylvania at 42nd & Spruce (now Penn Alexander School). In 2000, Neighborhood Bike Works (NBW) moved to St. Mary’s Church at 40th & Locust Walk. In the following years, Earn-A-Bike, Saturday Drop In sessions, and Monthly Group Rides became staples of our program offerings where young people between 8 and 18 years could build bikes, go on group rides, learn mechanics and life skills, and make friends. “Bike Church,” a program for adults to use NBW’s workshop and tools, offered a space for anyone over 18 to learn about bikes, fix bikes, and help put the hundreds of bikes donated each year back into use. You might already know Alex from the many years he spent at the helm of the Bicycle Coalition of Greater Philadelphia, serving as Executive Director from 2004 to 2015. At the Bicycle Coalition Alex grew the organization from a staff of two to more than 20. 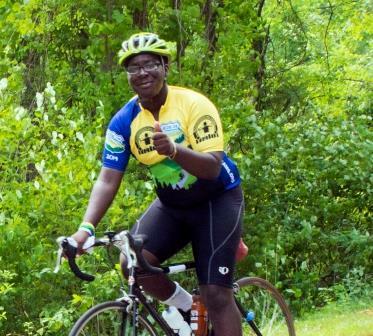 Following his work at the Bicycle Coalition of Greater Philadelphia, Alex made a national impact, working as Executive Director for the League of American Bicyclists. After a long history of partnering with NBW, Alex joined the NBW staff in August 2018. Lula is on a mission to create healthy communities. At NBW Lula provides program oversight to ensure our programs are accessible and impactful, generating positive change and healthy habits for the youth and community we serve. Prior to joining NBW in summer 2018, Lula worked as a Prevention Manager at the Coatsville Youth Initiative. In her role, she worked in drug use prevention, providing positive alternatives for youth ages 12 to 24. Lula is no stranger to Philly. She has lived in Overbrook for 15 years and is deeply immersed in the Ethiopian community. Lula is excited to learn "bike language" and get to know the youth and community we serve. Amy oversees NBW's administrative systems and our shop inventory management. She spends quality time with NBW's beloved database, maintains the NBW website and manages all on-site accounting. Quickbooks is her jam. When not drafting finance reports at NBW, you can find her cooking, running, or biking (duh). Amy has long believed that bikes deserve a respected place in the US economy, with practical uses that extend far beyond recreational riding, or even commuting. In 2012, Amy used a bike trailer to move all of her worldly possessions into her home. Meesh, hailing from Philadelphia, hopes to make a bigger impact in her hometown where she fell in love with cycling. Meesh was introduced to NBW in 2005 as a bike commuter when she attended and eventually volunteered at Wednesday night Bike Church. Over the past 15 years Meesh has worked and volunteered in non-profits all over the country commited to music, education, community building, and animal welfare. Her experience ranges from event production and organization, to outreach and teaching/mentoring at-risk youth. She holds a bachelor's degree in Fashion Design from Philadelphia University and is a believer in the ethical treatment animals. When she's not writing grants or planning the next big party at NBW, you can catch Meesh in a kit going fast, hitting a corners apex like nobody's business, or nerding out while training for her next road race with Mathletes Racing. Alexander "Alex" Harris is a graduate, long time volunteer, and patron of Neighborhood Bike Works. Alex joined the NBW staff in summer 2018, teaching campers how to refurbish their bikes. Alex also teaches NBW's High School Earn-A-Bike class, manages NBW's apprenticeship program, and works in our retail shop as a mechanic. He began his tenure in our Earn-a-Bike program in 1997 at a tender 8 years old. Alex has a passion for building, customizing, repairing, and riding bikes. Aside from his passion for educating youth, he is a music lover, DJ, and Producer. Eugene came to NBW as a Bike Church Facilitator for NBW's Women and Trans Nights in Spring 2014. This was a natural fit as they are driven to improve access to transportation resources (like bikes), with a passion for helping women, gender-nonconforming, and trans* folks increase their mechanic skills and grow their comfort working and riding bikes. Eugene teaches NBW's Adult Bike Repair Class and staffs Mel's Community Bike Shop. In addition, they manage NBW's inventory and site maintenance. Florence joined our staff in summer 2015, offering her mechanics skills to the team at NBW's former retail location in North Philly. After a breif hiatus, she rejoining the NBW team in West Philly. Florence coordinates bike drives and keeps Mel's Community Shop and Bike Church well-staffed. Florence has worked in bike collectives and as a professional bike mechanic for several years. She is excited to take on the challenge of recovering every unwanted bike in Philadelphia for NBW programs! National Manager of Medicare Services, GENEX Services, Inc.